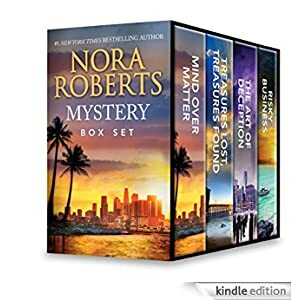 From bestselling author Nora Roberts comes four fan favorite stories of romance and intrigue! Buy this bundle for only $2.99 today. Mind Over Matter: David Brady needs a star for his documentary on paranormal psychology. When he finds out theatrical agent A.J. Fields has a psychic for a client, he’s thrilled. David knows that A.J.’s icy exterior is just a front. Treasures Lost, Treasures Found: When Kate Hardesty inherits a pile of her late father’s ocean charts she must turn to Ky Silver, the man she swore she’d never trust again. The Art of Deception: When the handsome Adam Haines shows up at Kirby Fairchild’s ancestral home looking for a quiet place to paint, she’s more than skeptical. But when Adam begins to act suspiciously, Kirby must uncover his real purpose at her father’s home…before it’s too late. Risky Business: Liz Palmer’s idyllic life in Cozumel has comes to a jarring halt when her employee is murdered and his brother storms into Liz’s life with revenge in his heart.